People are either cat people or dog people. I also think people are either shark people or dolphin people. I am definitely a shark person. There is something about the way they move in the water, their intenseness but at the same time their calmness, that really fascinates and terrifies me. None of this poncy, squeaky dolphin business (though, as The Simpsons once showed in a Halloween episode, dolphins may be out to kill us all!). I don’t know if it was watching Jaws, or seeing the uber intelligent sharks in Deep Blue Sea, that made me get my love of Great White Sharks. 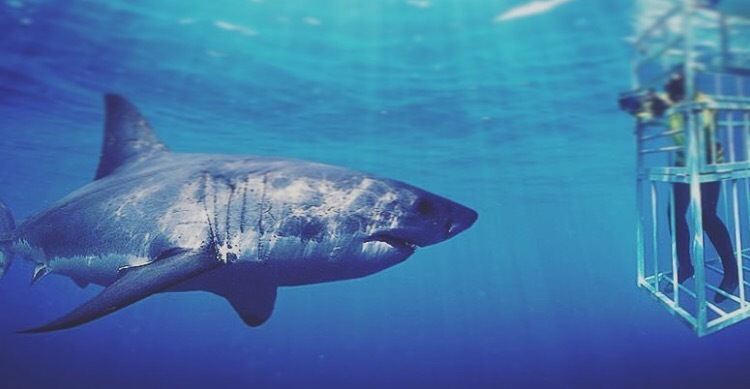 As much as the idea of going to the beach, taking a dip in the sea, and then coming face to face with a Great White isn’t something I would want to experience (not sure I’d get out of there alive! ), I would like to bump into one in a more controlled environment. For as long as I can remember I have wanted to swim with sharks. When I was 20 I slightly fulfilled this wish by swimming in the (baby) shark tank at Sea World, Gold Coast, Australia. Looking back on it I really can’t count this as shark swimming. There weren’t many sharks in there and they were all tiny – in fact I think there were more rays than there were sharks! I also wasn’t good at scuba diving so I just floated along the top, not really the best way to get up close and personal to all the fished! At the time it did make my heart race a bit though. And it was next to a tank which housed the ‘big’ sharks – I was too much of a scaredy cat to book tickets to swim in there. 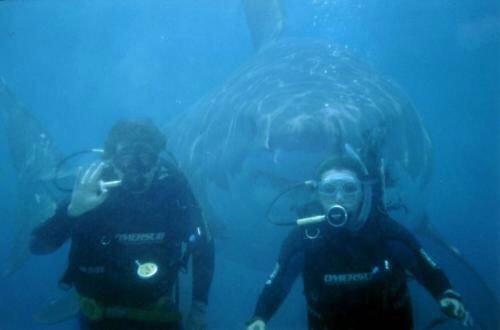 Since then I have upped my shark diving wish to something a lot bigger and a lot scarier. And that’s to see the Great White Sharks in the ocean. Move over baby sharks, I’m ready for the big ones! As mentioned in my Cape Town blog, I would love to do this in South Africa. I don’t know why, but this is where I imagine the best cage diving would be, and I can imagine they always see Great Whites when they go out. I have spoken to a couple of people who have done this and they said it was one of the best experiences they have ever done. Jealous! That’s not to say I wouldn’t poo my pants when I got in there (well hopefully not literally!) but the adrenaline that would flow through your body, and the feeling of being in the presence of such an amazing animal (fish) would be an experience I would never forget. So I leave you with this picture, that always makes my heart skip a beat. I let you decide if it’s real or not.